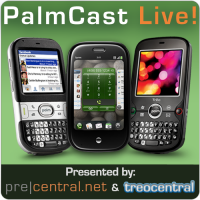 PalmCast Live: you know it, you love it, you can join in tonight at 8pm Eastern, 5pm Pacific. Our straightman Derek is away, but Jonathan Ezor has manfully volunteered to enter the lions den of snark and with Keith and Dieter. All three of us will have two weeks of Palm happenings to discuss and plenty of rumors to monger. If you're on The Twitter, send us A Tweet with the #palmcast hashtag and we'll talk it up during the show.